A stunning instrument regardless of price or provenance. Sounds like an angel and doesn’t look half bad either. The North American Guitar Company is renowned for bringing guitars into the country that most of us could only dream of affording. Of course, we love to review them because it’s rare that we get to touch something that valuable unless we were to dig into our own sides and grab a kidney. Yet TNAG is aware that there is, in the UK, a growing market for people who want boutique and luxury guitars, but at slightly more affordable prices. This is why if you were to go on the website, among the names like Astrand, Gaffney and Kostal, you’d find Andrew White. Not that Mr White doesn’t offer guitars with eye-watering price-tags - guitars from his signature range start at around $7,000 and go up quickly once you start adding on the extras (believe us, we’ve been pricing up our dream model in the office and it quickly got out of hand). But White, like more and more luthiers, realises the value in taking the designs from his signature range, that he has spent years of his life refining, and having them factory-made overseas, in this case Korea, to give more people the chance of playing his instrument. And considering we have a guitar here that is a fraction of the cost of a White handmade model, we’re already onboard with that decision... we mean, it still has the same name on the headstock, and who’s going to be peering into your soundhole to check the ‘made in’ stamp on the sticker inside? White’s signature range models have the C, E and F designations, while his production models, which are all named after gods, carry the marques Cybele, Eros and Freja - so it won’t be hard to work out which one to upgrade to if you fancy dishing out the extra cash a few years down the line. We have a Cybele on test here. The Cybele is White’s attempt at something that sits between a parlour and a 000. The guitar’s flamed maple binding is simply exquisite, and sets off the Sitka spruce top against the nicely figured rosewood back and sides. 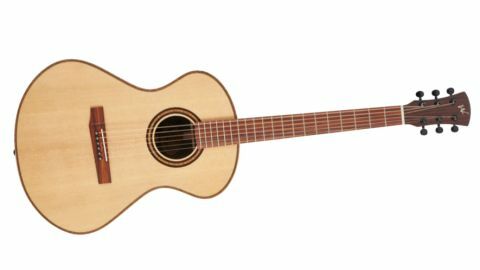 The spruce top on the Cybele has tonnes of character, an evenness to the grain pattern that elevates it above the usual. The guitar fits to the body nicely when seated (which is where you’ll start playing it as this guitar lacks a neck-side strap pin), and the satin finish on the comfortable C-shaped neck mean that your fretting hand will be racing around with no interruption. The tuner and machine head is black, which works better than gold on these guitars, and have an 18:1 ratio. They operated fine in my time with them, jumping around from standard to DADGAD, DADF#AD and variations there on. The build quality is good. In fact, the Cybele 1010 is an absolutely fantastic guitar. That extra money in comparison with the recently-reviewed Freja may not have immediate visual justification, but it sounds like a guitar well above its asking price. It is a beautiful sounding instrument, with a rich and complex tone that seems to float in and out of your ears as it washes over you. It sustains as well as any instrument we’ve played of a similar body size and packs a remarkable amount of volume without ever sounding shrill or harsh. It’s low end is nothing short of staggering, but it needs to be to complement the gorgeous tones higher up the frequency range. There is little that we can see this guitar struggling with. It plays and feels superb under the fingers - again that neck really is fantastic - and it responds equally dynamically to fingerstyle as it does to a pick. The Cybele 1010 is a guitar that has gone straight onto our wishlist.